In the month of June 2018, the Archaeological Survey of India had found some Chariot relics belonging to Mahabharata epic era in Bhagpat, UP during an excavation operation. This sensational discovery had hit the media and the Hindu heritage buffs were naturally pushed into celebration mode. Within a couple of day’s of this discovery, I had expressed my conviction that these Chariot and other relics from UP could very well be of Mahabharata Age. My conviction was then based on some strong evidence, like the artifacts that were recovered from the site, and the site’s proximity to the other famous Mahabharata era places as described in the epic itself. Now the news is that these relics from UP were shifted to Red Fort, Delhi and a huge and in-depth study is being undertaken by the ASI as well as some experts. The outcome of this study, which has been discussed with the media by the ASI officials on 30th July 2018, is highly gratifying. 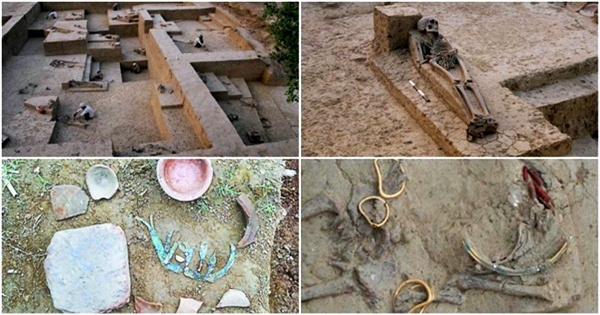 The Director of Institute of Archeology, Delhi Sri Sanjay Manjul said these new findings and artifacts could give a new dimension to India’s past. He further informed that this was the first time ‘Chariots’ relics were found in the entire Asian region. He further confirmed the fact that only in Greece and Mesopotamia, Chariots were found earlier. From this angle, this discovery of chariots in Bhagpat India has attained an immense importance in the world of archaeology. These findings, in fact, is going in conformity with the Hindus greatest Epic Mahabharata, as last year the believers of Epic Ramayana got a shot in their arms when NASA vouched for the fact that the Ramasethu was a man-made bridge and its historicity pushed back to thousands of years in BCE. For the first time, an antenna sword was found. Many swords found with hilt design. The Coffins have four legs with copper leaf designs engrossed over it. In total 8 burial pits were found and in one pit, a pair of twins with a dog were recovered. These pits were plotted with food items, gold, beads etc. The Director has confirmed the fact that the burial sepultures, were found to be more elaborate than the ones found in Lothal and Rakhigarhi. In my view, this is an important observation as, till today it is believed that the site at Bhagpat would belong to ‘mature age period of IVC, as it was generally and logically believed that the IVC sites in the western region of India must be earlier ones, and when the nomads were moving towards east of India (may be influenced by the dead theory of ‘Aryan invasion’) they believed the sites around Bhagpat are of late mature period of IVC. Due to the high significance of the findings in Bhagpat, an elaborate scientific scanning is being undertaken on the artifacts. X-ray, in-suit CT scan, Infrared photography were all employed for the first time to analyse the burial sites. Further DNA tests would reveal in finality, who the inhabitants were. Metallurgical tests on the metal artifacts are too undertaken. Soil samples from the cloth shreds, broken pottery were undertaken to find out the peoples farming and food standards. Finally, Paleobotanists were also on the site to examine the remains of plants for biological reconstruction of the site that existed 3000 yrs ago. This site in Bhagpat is encircled by many Mahabharata sites like Bijnor, Panipat, and Sonipat. If we go back to the great Mahabharata epic time, Bhagpat, Sonipat and Panipat were three of 5 towns that Pandavas did demand from Kauravas during truce talks. Bijnor is the city belongs to Pandit Vidhur. There is a Kutir right now in Bijnor known as Vidhur Kutir. Hastinapur, Kurukshetra at 40 km from Ambala, Banganga Kurukshetra near Kurukshetra where Bhisma fell on a bed of arrows, Varnavat just 35 km from Bhagpat, where Kauravas built the famous Wax Palace to kill Pandavas. The trustworthy aspect of our Mahabharata and Ramayana is the description of geographical areas of the time, which perfectly match with the present topography, mostly tallying with the present names of towns in existence today. While I was excited about these findings on the relics from UP and eager to hear more such discovery of Mahabharata time Palaces this time, like the Maya Sabha palace etc, our Tukde Tukde gang were much worried about these findings day by day. The Print last month (June 2018) covered the Bhagpat findings and almost cried foul, in a typical Leftist- sadist note. The Print interviewed a research student from JNU, where she debunked these findings as false and the Chariot, in fact, could be a bullock cart and did cast aspersions on the very ASI hinting they may be lying about the findings only to hype the Hindutva sentiments. This is what The Print reported in its issue in June 2018: The discovery in Uttar Pradesh’s Sinauli could alter the understanding of contemporary Harappan culture, says Archaeological Society of India; scholars dispute chariot claim. This is the height of hypocrisy and cynicism on the part our liberals. I am sure in any other country, the news of such findings would have hit the front page headlines, and the whole nation would be celebrating in ecstasy, yet for Indian media, it is the moment for grief and vexation. This article on relics from UP was first published at myvoice.opindia.com. Mahabharata War 7500 Years Ago? What Astronomical Calculations Say! The Mahābhārata Retold: From Emergence of Brahmānda to Political Unity of Bhāratavarsha 2000 BCE Bhaghpat Chariot and its Impact on Archaeo-Astronomical Dating of Kurukshetra War Hindu Kashmiris Recorded Supernova in Stone 5000 Years Ago in Mahabharata Times Saiswaroopa Iyer: Best Selling Author of ‘Abhaya’, set in the Mahabharata Period 75000 Year Old Artifacts of Jwalapuram Demolish 11000 BC Mesopotamia Agriculture Theory!